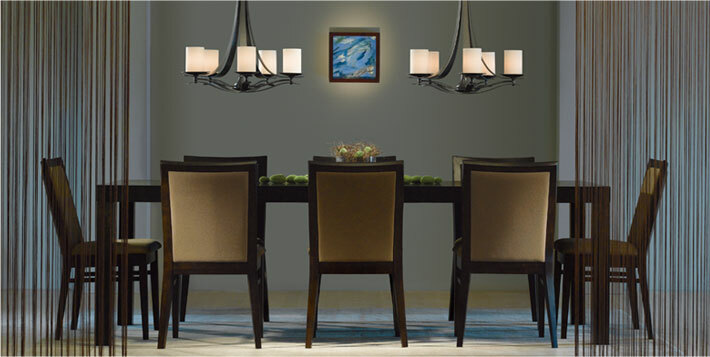 Add artistic touches with Lightolier’s Lytecaster Recessed Downlighting fixtures are ideal for art lighting. The adjustable recessed slots provide the right amount of lighting for illuminating artwork and wall décor. 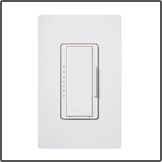 The Lutron Maestro Digital Fade dimmers allow you to control the atmosphere in the dining area. When selecting a dimmer, be sure to select a color that will blend subtly into the wall color. Using two chandeliers as the room’s centerpiece adds a beautiful artistry to the table area. With a burnished steel finish and opal glass tubes, this lighting fixture radiates warmth and adds a contemporary twist to a traditional style. 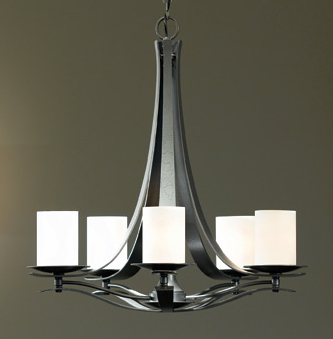 The 5-arm Berceau Chandelier canopy kit includes 15’ of wire and 3’ of chain. Fluorescent version is available. OPTIONS: Burnished Steel Finish with Opal Glass (as shown) – other options available. 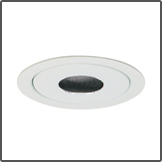 With 3 ¾” aperture pin hole reflector trim, this Lytecaster recessed downlighting offers maximum glare control and an inconspicuous look to precisely highlight an object or surface with a warm incandescent glow. Complete fixture consists of the reflector trim and frame-in kit. At the touch of a button, this dimmer can go immediately to a favorite preset light level, fade-to-off, or adjust manually. Customize your lighting controls with multi-location dimming and advanced programming options. Source types include fluorescent and LED lighting, as well as fans. Choose from a variety of wallplate colors and finishes. The transitional lighting style reflects a fusion of traditional and contemporary furniture, finishes, materials, and fabrics. Simple yet sophisticated furniture lines paired with diverse fabric patterns characterize the transitional style, blending influences from various style categories. This unexpected combination of relaxed and formal decors, along with the wide range of multiple style elements, creates a classic and timeless feel throughout your home.